Sitter: Edward George Henry Montagu, 8th Earl of Sandwich (1839-1916). Biog: Colonel, Grenadier Guards; Military Secretary at Gibralter; attached to several special embassies; M.P., Huntingdon; philanthropist; exponent of spiritual healing. Occasion: The Devonshire House Ball, 2 July 1897. Location: Devonshire House, Piccadilly, London, W.
Descr: FL standing, with white wand of office. Costume: "...blue grey satin embroidered in silver, order of the garter." (The Court Journal, 10 July 1897, p 1248c). Furniture & Props: Painted backdrop with landscape after Reynolds;2 studio balustrade; studio Persian rug. Photographer: J. Lafayette, 179 New Bond Street, London, W.
Occasion: Sophia Murphy, The Duchess of Devonshire's Ball, London, 1984. 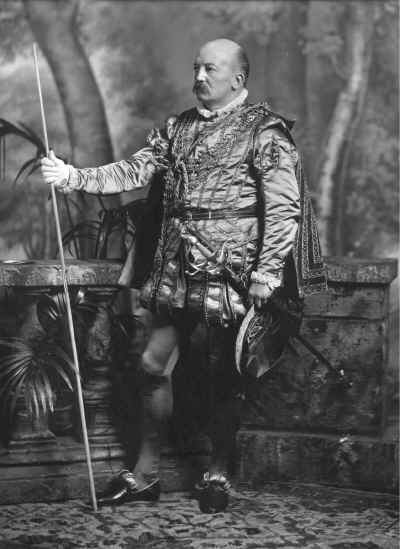 Role and Costume: The Daily News, 3 July 1897, p 5g; The Daily Telegraph, 3 July 1897, p 10b; The Morning Post, 3 July 1897, p 8a; The Court Journal, 10 July 1897, p 1248c; Lady's Pictorial, 10 July 1897, p 70b; The Queen, 10 July 1897, p 76b. Reproduced: Devonshire House Fancy Dress Ball, July 2 1897: A Collection of Portraits in Costume of Some of the Guests, privately printed, 1899, p 218, (National Portrait Gallery Archives). 1 William Cecil, 1st Baron Burghley (variant sp. Burleigh) (1520-1598); Chief Secretary of State and Lord High Treasurer of England.